The Friesian mare Bella will be brought to her new stable today. The groom Betty leads her carefully into the spacious horse trailer. Then she climbs into the pick-up and the ride can begin. Good luck in the new stable, Bella! Because she loves it so much, Betty the groom gives her Friesian mare Bella another good brush. The horse can sense that something special is happening today. And she’s right: today, Bella is being taken to her new stall. After she has been properly tended to, Betty leads her carefully into the spacious horse trailer. Bella has a calm and peaceful temperament, but it still makes her very excitable. Then Betty gets into the pick-up and they slowly set off from the stables. During the journey, the mare looks around curiously. They will soon be at the new stall – and then, first things first, Bella will be allowed out onto the paddock. 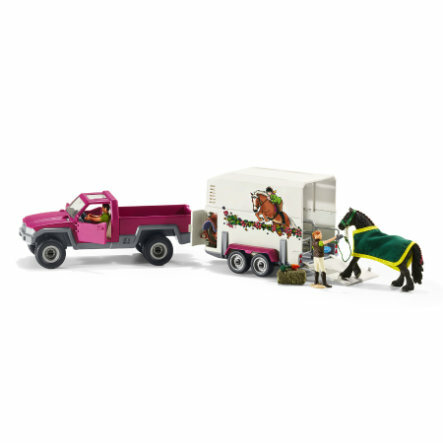 Lots of horses get agitated when they travel in the horse box. But if they’re well tended to, they will be less excitable. Many great play functions. Modelled true to detail and with many loving details. Not suitable for children under the age of 3 years. Contains small parts that could be swallowed. Choking hazard!